USB flash drives are a convenient way to transfer information from one computer to another. But what if you need to transfer data from a computer to say, a smartphone? With the announcement of a new 2-in-1 USB flash drive from Imation, it may be time to kiss your USB cables and card readers goodbye. 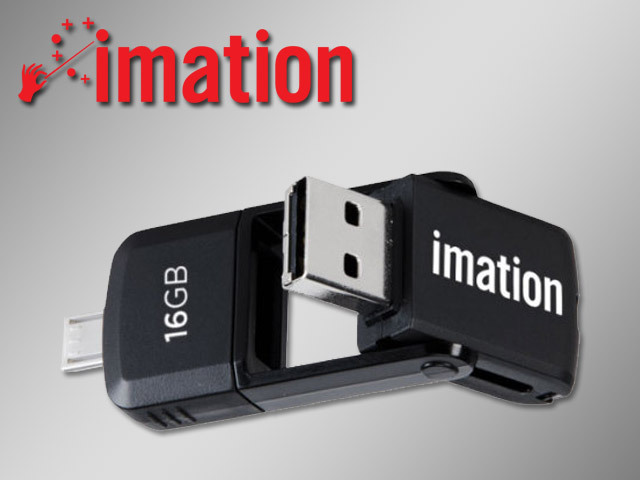 Unveiled at this year’s CES Show in Las Vegas, Nevada, the 2-in-1 drive from Imation features a full size USB connector that docks into a Micro USB connector, which is found on nearly all Android-powered smartphones and tablets. This swivel design is not only quick and easy to use, it is also brilliant in its simplicity. This product will also add additional storage space for those Android users without removable MicroSD cards in their phones – such as the Galaxy Nexus and the HTC One. Imation expects the drives to go on sale in the first quarter of 2014 in 16GB, 32GB, and 64GB capacities with pricing at $29.99, $39.99, and $64.99 respectively. This entry was posted in Imation and tagged Android, Imation, Micro USB, smartphone, USB drive, USB Flash Drive. Bookmark the permalink.